Keep up with Brain Blox at instagram.com/brainblox. “The more passive the toy, the more active the child:” that’s the theory driving Brain Blox, a simple collection of same-sized wooden planks sold in a Santa-red drawstring bag. Children can stack the planks to make anything from forts to robots, lay them out into roadways, even draw characters onto their pine surfaces. 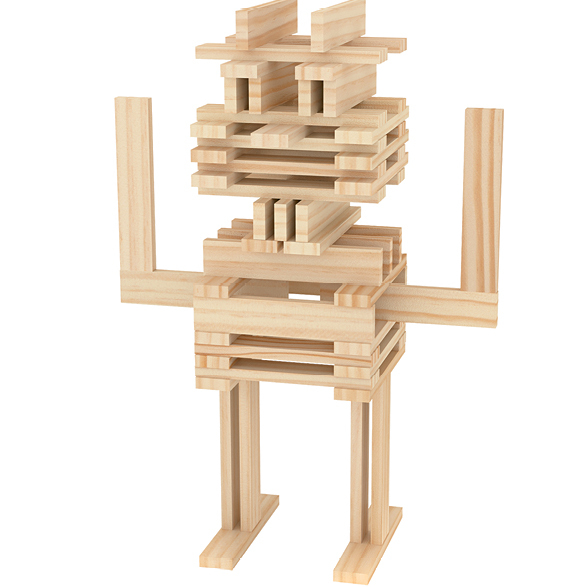 To kindle inspiration, each set of 100 to 300 planks ($30-$60 on amazon.com) comes with a ”Building Ideas” booklet, while mybrainblox.com offers more designs and puzzles. And it wouldn’t be a modern kids’ biz without a YouTube channel. Brian—who’s worked in marketing and brand development for the likes of Procter & Gamble—heads up video creation. Some invite builders to follow along in shaping airplanes or solving brain teasers. Others, like “Bacon Dog Treat Contraption,” starring the Sweets’ pooch, are pure, hilarious entertainment.